It's got a December 8th release date, which means I'm massively looking forward to it already - after all, it should definitely feature some of my favourite characters, not to mention the wonderfully mysterious Darujhistan. Which I already featured as one of my best fantasy cities - here. So, what other news have we got? The fantastic Daughter of Smoke and Bone has got a new book trailer, which looks great. If you haven't already read it, I'd advise checking it out - as you can see from my review here: review. Check it out on Amazon here: Daughter of Smoke and Bone . Read or looking forward to any of these? Comment and tell me below! New follower. Like the trailer very much. Come visit me over at Livre De Amour-books of love blog. Like the title of your blog very much. In Fla right now. Yes, it's pretty good - I'm following back as well. I desperately want to get my hands on Daughter of Smoke and Bone, but going to have show some patience as it's not out here till the 29th of this month (rubbish). The Mazalan series looks pretty awesome too. 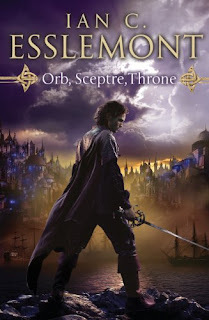 I do love a good fantasy, and there are totally ships on that cover! Just tiny tiny ones in the very far distance.